KNM ER 992 is a mandible that was found in two halves, with missing incisors, part of the left condyle and most of the ascending rami3,4. 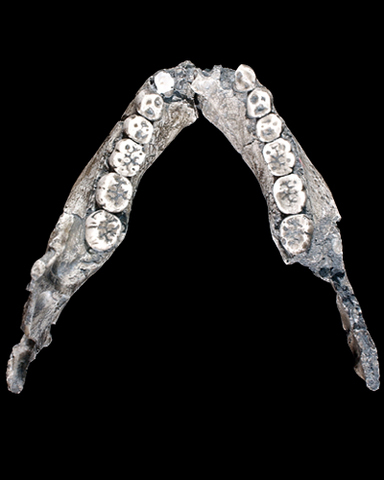 The mandible is more gracile compared to Australopithecus, with relatively small teeth1, including a reduction in the size of the postcanine dentition2. Researcher have proposed a modern dental eruption for this species2. Leakey REF. 1972. Further Evidence of Lower Pleistocene Hominids from East Rudolf, North Kenya, 1971. Nature 237: 264-269.